Some Legion updates, more coming soon. Subtlety Rogues are often thought of as the PvP Gank Machines (which they do quite well, thank you,) but they can also put out some very solid DPS in instances, it just requires a bit more work. If you’re up to it then go for it, the potential is definitely there. Some updates for Legion are here, the rest are coming soon. This Subtlety Rogue guide is primarily intended for use at level 100, in dungeons and Raids. If you are not yet 110 and you want the same in-game step by step leveling guide that we use to get to level 110 as fast as possible, take a look at our favorite in-game leveling guide. The talents that are most useful might vary from situation to situation. Previously you needed a tome of the Clear Mind to change them. No more. You can now change your entire specialization (spec) at any time you are out of combat. Do one fight as Sub, another as Outlaw, another as Assassination, and then switch back again. No reagents, trainers, or anything needed. Just make sure you have your talents set up ahead of time. Talents can be changes just as easily except that you have to be in a rested XP area, such as an inn, the big city, or your Garrison. If you’re there you can change them as much as you like, no reagents or anything needed. 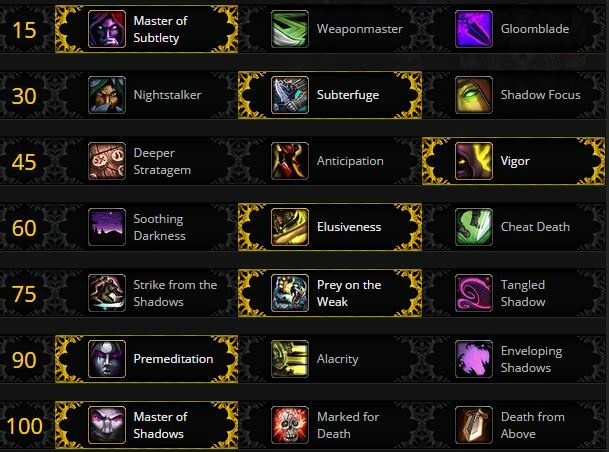 Note that Ability perks, from Draenor, are dead. Master of Subtlety – Attacks made while you are stealthy or in Shadow Dance, and for 6 seconds after breaking stealth, do 10% more damage. With a little care you should be able to keep this buff up much of the time, which is pretty sweet. Weaponmaster – a chance for any of your abilities to hit the opponent twice. A little extra damage that requires no management on your part. Gloomblade – Replaces your Backstab and has no positioning advantage/requirement. Does more than the base Backstab and less than the “Backstab from behind.” Nice if you don’t want to, or can’t quite (perhaps due to lag,) position yourself behind the target. In most PvE you should be able to stick behind the target and backstab. Subterfuge – Use stealth abilities for 3 seconds after leaving stealth. Adds 2 seconds to your Shadow Dance. This make Subterfuge and easy first choice. Deeper Stratagem – Passive. You can now store and use up to 6 CPs on your finishers, plus your finishers do 10% more damage. Certain artifact traits at 110 might make this a better pick than Vigor. Anticipation – Passive. you can store up to 8 CPs, but only use 5. No other bonuses. The other two are better. Vigor – Passive. 50 more energy and 15% faster energy regen. Nice if you’re feeling energy starved. Very nice for that bone crushing Shadow Dance burst. Soothing Darkness – heal up while in stealth. Probably better for questing/leveling than it is for anything else. Elusiveness – Passive. Your Feint now works for all damage, reducing it by 30%. It still reduces area damage by 50%. Nice general damage avoidance ability. Cheat Death – Passive. Yes, Rogues cheat. If you’re hit with a one shot kill you will instead be reduced to 7% health and take far less damage from all attacks for three seconds. Won’t happen more than once every 2 min. If you’re not sure of a fight, or you’re unable to avoid the occasional Rogue Squishing, then this is a good pick. Strike from the Shadows – your Shadowstrike also briefly stuns the opponent (players are “dazed” for 5 sec.) Diminishing returns still applies, so your follow-up Kidney Shot isn’t going to last very long. Prey on the Weak – Passive. After you use certain incapacitating strikes your opponent will take 10% more damage from all sources. The strikes are: Kidney shot, Cheap Shot, Sap, and Blind (Assassination no longer has Blind.) Nice for when certain adds just need to be dealt with right now. Tangled Shadow – Your Nightblade reduces your target’s movement by an additional 20%. More use in PvP than PvE. Premeditation – Your Cheap Shot and Shadowstrike generate an additional 1 CP. Be careful to keep an eye on your Combo Points as this will make it a bit easier to hit the cap and waste points, such as if you’re 1 short and this provides 2 points. Alacrity – Your finishers have a chance to add 1% Haste, possibly stacking up to 20 times. Only useful on fights where you can constantly attack. If there’s a break then the buff will go away. Master of Shadows – Immediately gain 30 energy when entering Stealth or Shadow Dance. Glyphs in Legion are basically dead. There are a few “minor” glyphs, but they are purely cosmetic, with no combat effect at all. For example, Glyph of Disguise. Swapping glyphs is easy and can be done almost any time. Keep a stack of Tome of the Clear Mind handy and swap glyphs as the situation demands. If you know the fights well you will be better able to swap glyphs to those special occasions. Glyph of Energy offers up 20 more of a most needed resource. Glyph of Hemorrhaging Veins – Your Sanguinary Vein now also applies to your Hemo bleed. This make Rupture less important and can simplify your rotation. Glyph of Blind – If you use Blind often enough then this glyph is very worthwhile. It’ll make that that your Blind sticks. Glyph of Feint – Increases the duration of your Feint ability, which has its uses. Even better when combined with your Elusivesness talent, above. Glyph of Evasion – Handy at times. Glyph of Energy Flows – is very handy if you’re evading a lot as it increases energy return while evading. Glyph of Cloak of Shadows – Great if you’re taking physical damage. Glyph of Safe Fall – Just in case you’re jumping off of stuff. Glyph of Blurred Speed lets you sprint across water. It does not work with Burst of Speed. Subtlety loves the Mastery and the Crit. Haste isn’t a lot of use since most strikes are instant, but the added energy regen can be nice, so it isn’t worthless. Versatility is nicer in PvP than PvE, but since it’s a straight up damage add it has more value than Haste. In Warlords your Hit, Expertise, and ability to reforge stats died. You gained two new stats, Multistrike and Versatility. The latter improves your damage and defense, the former gives you a chance for two additional strikes at about 1/3 effectiveness. Legion removed Multistrike and your “Attuned” stats. Blizzard has also defined “Attuned” stats for every class and spec. As a Sub Rogue, yours is Multistrike. What this means is that Bliz feels that this is the stat which will give you the best “throughput.” In your case, this means damage. You get that additional 5% through your Sinister Calling ability. The exact value of your secondary stats will depend on your exact gear and gear level. Agility: Agility is significantly better than the other stats. Mastery makes your Eviscerate and Nightblade hit harder. Crit makes anything hit harder, when the numbers are right. Haste speeds up your energy regen and your attack speed, so you get more attacks and faster energy regen. Mastery and Crit will be better for your overall damage, however. Versatility is a straight up add to your damage and healing and, at half value, damage reduction. Not enough to bump off the other stats. Stacking stats: Since Reforging is dead you will have to get your additional stats the old fashioned way. That is – through gear choice, gems, enchants, and whatever player buffs are to be had. Gems and enchants do not offer Agility, so additional Ag. will come from gear and buffs. Note that Combo Points stay with you, not the target. Tricks of the Trade Puts aggro onto your chosen team member, allowing you to attack first and give that aggro to your tank. Shadow Blades is back. Backstab no longer requires you to be behind the target, but you get a damage bonus if you’re behind or to the side. Ambush is replaced by Shadowstrike. Ability perks, from Draenor, are dead. Poisons are Assassination only in Legion. You have a couple of abilities which make it valuable to attack from stealth as often as possible. Master of Subtlety causes 10% extra damage when coming out of stealth or Shadow Dance. It lasts for 6 seconds. Backstab – adds 1 combo point to the target. You get a damage bonus if you’re behind your target. This will be your primary attack in most situations. Shadowstrike – adds 1 combo point, two with the Premeditation talent. Teleports you (up to 25 yards) to the backside of the target where you can continue with Backstab once your stealth/Dance wears off. Shuriken Storm – adds 1 combo point for each target hit. Deals weak AOE damage. Generates 1 CP per target hit. So if you’re in a group of mobs you can alternate Shuriken Storm and Eviscerate. Your mastery improves all finishing strikes. You will be rotating between Eviscerate and Nightblade. Try to refresh your 5 CP Nightblade with 5 seconds or less remaining. Slice and Dice – Increases your attack speed drastically and procs Energetic Recovery. Keep this up at all times. Eviscerate – will be your main finisher. Death from Above (level 100 talent) uses more energy and hits harder. Shuriken Storm – AOE physical damage. You should use this any time that you are fighting multiple opponents. Shadowstrike should be used as your stealth opener as well as primary attack when Shadow Dance is active. Use Eviscerate or Death From Above when you have 5 combo points and don’t already have the Nightblade DOT up. Shadowdance on cooldown. See the “How to Shadow Dance” section, below. Pool energy before dancing or blowing cooldowns. Shadow Dance gives you 3 seconds (5 with the Subterfuge talent) of murderous efficiency/ Here’s how to do it right. Practice this on the target dummies until you have it down. Shadowstrike is your Combo Point Builder while dancing, note that you don’t have to be behind the target, it’ll put you there. Eviscerate is usually your finisher, though you might want to add a Nightblade and/or Death from Above. When facing multiple targets numbering about 5 or more begin using Shuriken Storm as your primary attack and alternate it with Eviscerate to spend the CPs generated. Use Shadow Dance on cooldown. Use Vanish on cooldown to enter stealth and immediately use Shadowstrike. Tricks of the Trade transfers your threat to the party member targeted. Cloak of Shadows and Evasion are potent survivability tools which should be used when you feel them necessary. Cloak of Shadows lets you completely negate chunks of magical damage and can also be activated to drop particularly harmful debuffs. The glyph applies your cloak to physical effects, too. Evasion is only useful when facing attacks where you can benefit from the increased dodge. In short: Gem for Mastery at 100, Agility if you’re 90 or less. Agility is your best stat. Remember that your leather bonus adds to your Ag. Unfortunately there are no Warlords or Legion Agility gems or enchants. The 6.2 gems “immaculate” add 75 to the stats, instead of the +50 of the earlier gems. They might be a bit expensive, however. Gem for Mastery for harder hitting finishers. meta: Agile Primal Diamond unless you can get a Capacitive Primal Diamond. Blue: Glinting Imperial Amethyst – Keep an eye on your Hit totals. Note that there is a basic green gem for each of these that adds +30 stats and is far less expensive. Short on gold? Most of the enchants below have similar enchants available, of lesser value, for less cash. Check with the rep vendor or the Auction House for others. If you want to buy the best enchants, fund all of your alts, donate to the guild, etc., but don’t have the cash, then see what the Tycoon Addon can do about about improving your situation. Helm enchants are gone in Mists of Pandaria , shoulder enchants all come from the Inscription profession. In Warlords you can now get enchants for rings and neck pieces, but the profession enchants are all dead. Enchants that previously did Hit have been changed to Crit, those that had Expertise are now Haste. Pre-Warlords enchants are shown if you’re doing lower level stuff. Macros simply wrap several commands into one (or maybe two) keypress. They make sure you use certain abilities in the right order and just make things easier. See our how to macro post if you want help getting started. If you want more macros, keybind help, and more, all in an addon, check out Impulse. Add /startattack to any macro to make sure your auto-attack starts on whichever target you are attacking or switch to, just incase your energy is too low for your main attack. For example, this one makes sure your auto-attack is up on your new Fan of Knives target. Casts Tricks of the Trade on your DPS target or tank by name. Manually change the name to that of your target. Note that Tricks no longer gives your target a damage buff, it now only transfers threat. This will let youi attack first or burst to your evil little heart’s content without worry about drawing aggro. You can also use @focus or @mouseover to tricks your focus or mouseover targets. If you hold down the CTRL key then this will Kick your focus target, if it’s kickable. Otherwise it’ll kick the current target. You can use ‘alt’ instead, if that works better for you. This format works on other abilities, such as Blind. This macro activates your trinket and casts Shadow Dance. Click it a second time for Ambush. Note that ‘/use 14’ activates your “on use” trinket that you have in your second trinket slot (‘/use 13’ is for the first slot.) Yes, you can use all three, but test it on the dummies first so that you’re clear on exactly how they work together. Symbols of Death and Shadow Dance. All of the professions have had their special bonuses removed in Warlords. There is some nice gear that’s worth making and some of them are pretty good for making gold. Leatherworking will let you make entry level armor for raids (ilevel 640.) You can also make the items to reroll the stats and also to upgrade the armor items to 715, at a cost far exceeding that of the original piece. You can also make Drums of Fury for a Heroism type buff (25% Haste for 40 sec.) Through the Leatherworking hut in your Garrison you can make single use tents that will increase your agility by 10% for an hour, though not in raids. Alchemy Lots of nice chemistry, but chemicals are usually cheap on the Auction House, certainly cheaper than leveling the profession. Engineering will let you create a number of useful items, such as rockets, shields, a stealth device, etc. These cannot be used in rated PvP, but that can be used elsewhere, such as World PvP or in Highmaul Coliseum. Also has Nitro Boosts and mounts. Blacksmithing Mail and Plate armor (640) and weapons (630) and the items to both reroll stats and boost the items to 715 for the armor and 705 for the weapons. Keys for locks, though not Draenor locks. Skinning Just for the gold or to supply Leatherworking. Mining Just for the gold or to supply Blacksmithing. As Subtlety your consumable choices are pretty simple. Agility all the way. Your leather bonus adds to these numbers. Note that Pandaren Rogues get twice the food buff. All food buffs last one hour. Any race except Tauren and Draenei can be a Rogue. In Warlords any ability with Hit or Expertise has been removed and replaced. Except for Orcs. They just lost an ability, not that Axe expertise was any use to you anyway. Melee range stun (4 seconds) is a nice ability. You can always use another stun. Faster leveling from longer lasting rest XP. Improved alchemy will help you get into those nice potions that much sooner. Blood Fury is a very useful DPS ability since it’s a cooldown. Stick it into a macro. A decent DPS cooldown, Berserking, provides 20% attack speed every 3 minutes which can be used in conjunction with every Vanish. Fire off Berserking and attack. Beast slaing increases XP from killing beasts, which is nice if you’re leveling. Arcane Torrent generates some energy every 2 mins. and does an AoE silence (also interrupts non-player targets.) This gives it both PvP and PvE use. Touch of the Grave is a passive ability that drains life and heals you for the same amount. It will actually add a bit to your DPS numbers. Indefinite Underwater Breather will be useful in the open world, probably not so much in dungeons and raids. Good with Skinning, but the Crit bonus from skinning is your weakest stat. Shadowmeld will drop aggro when things get tight and might allow hiding from patrols in dungeons. Increased speed while stealthed is a nice ability, also +2% run speed. Rogue leveling is easy. All specs work well and regardless of which build you choose you will find leveling to be fast and smooth. Still, there are thousands of quests and a bazillion mobs to kill (not to mention other players, but they don’t count here.) Sorting out which quests are best and which series of quests will get you to 110 the fastest is another game, which is why we highly recommend Zygor’s Guide. 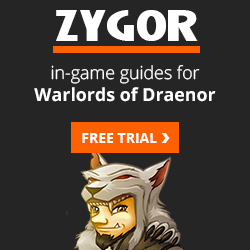 Zygor’s Guide is always updated for the latest patches and expansions, so is never obsolete. Grab your copy here or read our review. Great intel…cleared up a lot about haste. Found out that I was greatly overdoing it.